Our product range includes a wide range of auto drain valves and flameproof auto drain valve. Now FLAMEPROOF version also available! Fluidtecq Auto Drain Valves are most economical, simple & maintenance free systems. The compressed air / gas contains Inherent moisture which will condense in receiver tanks, filters and pipelines, which requires regular draining systems - Fluidtecq Auto drains are the best Solution! Available in wide range of port connection from 1/2" to 2". Coil voltage 12V / 24V / 110V / 220V / 230V AC and DC. With an arrangement of on-time & off time variable settings in secs & mins from 1-99, it provides an effective solution for condensate draining saving loss of maintenance hours and the costly equipments. 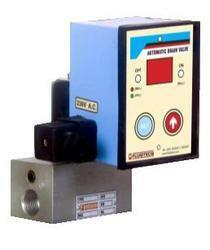 Auto drain valve is mainly used for compressors, air dryers etc for draining the moisture condensates. Digital timer with variable on & off timer settings will be saving manpower, electricity and can save this equipment from condensate problems, helps maintenance people free for other development activities. Flameproof auto drain valves by fluidize offers complete protection against hazardous atmospheres. The solenoid coil and timer both come with a flameproof protection. The auto drain valve has timer adjustments that are easy to set as per individual requirements. Packaging Details: Sea worthy packing available. Wooden box packing.